What Is I Ching Hexagram 40 All About? Hexagram 40 represents the passing of a difficult time. This might have left an individual with feelings of bitterness and blame. Now it is time to put what is in the past behind us to progress forward. Forgiving someone for an evil deed is hard. But it is our responsibility to forgive everyone to let go of the situation. Holding a grudge will only keep a person back from reaching their full potential. There will come a time when someone will do something to wrong us, to cause us harm. This will leave a bitter taste in our mouth from the event. Hexagram 40 shows that now is the time to put those feelings behind us to progress. We cannot move on in till we let go of what might be holding us down when it comes to our inner feelings. When a particular person’s name is mentioned, it is like a haunting from the past that stirs up old feelings of rage and pain. It is hard to forget about a person’s wrongdoings especially when they’ve had a strong impact on your personal life. Forgiving someone does not come easy, not even with the passing of time. It is an inner struggle we all must face at one point or another before we can move on and start anew. Starting again is a wonderful feeling when letting go of a troublesome period. Old emotional feelings will cause these strong memories to resurface from time to time. But to start again, we must banish them to be successful. Let go of everything that has been building up since a difficult phase. Take small steps to overcome the emotional roller coaster. The healing process will not be complete overnight. Start small and look at each day instead of each week. Take one hour at a time to endure and overcome bitterness and heavy grieving. There is not a limit to how much time we have to find peace within the world again. But starting the journey to finding happiness once again is the most important part. There is an abundance of beauty that is still waiting to be discovered in the world. I Ching 40 says that finding joy in each day will allow an individual to heal. And, you will start walking the life path once again. We need to forget about an old relationship that did not work out and find a new partner. It can difficult to seek new love when a past one was horrible. Just because one situation was difficult, does not mean the next one is going to be the same. Holding the harsh emotions inside will only prevent feelings of joy and love from filling our inner selves. In the work area, we might have to resolve a conflict to progress. Do not dream big at this point but take small steps forward. Do not let previous problems in business stop you from moving forward with new ventures. Life is not without pain and grief. But to know pain is to know happiness and to understand sadness is to recognize happiness. There is a balance to all things in life. We must let go of all negative feelings to heal and accept positive changes in our lives. All phases in life are temporary and will either end or have a turning point. Don’t allow sadness to hold you down from experiencing life again. Someone is waiting to enter your life or a new opportunity that is waiting for your readiness. 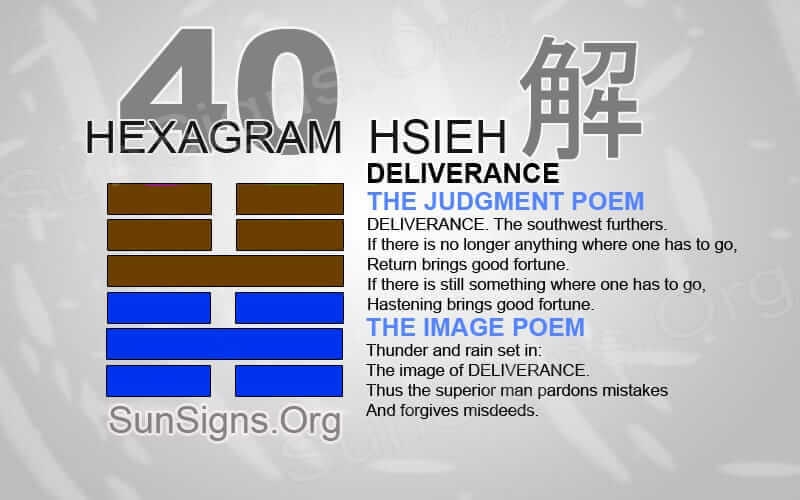 Hexagram 40 shows that importance of throwing away the old to receive the new.